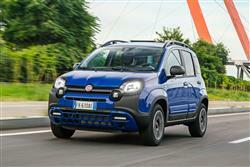 The Fiat Panda City Cross offers 4x4 looks in a more affordable guise. Jonathan Crouch takes a look. Although it could be accused of being all show and no go, the front-wheel drive Fiat Panda City Cross is too likeable to damn with such a verdict. In fact, it emerges as something surprisingly appealing. The Fiat Panda 4x4 you've probably heard of. It's a bit of a minor cult car. The Fiat Panda City Cross? This one's a bit more of an unknown quantity, but stick with us because it's a good 'un. The elephant in the room first. Despite looking ostensibly similar to the Panda 4x4, the City Cross only directs drive to its front wheels. That might well be enough to deter a few people who will immediately label it inauthentic, but those of you with less dogmatic standpoints might like to give it a chance. It almost seems a model out of time. A few years ago there was a big boom in this sort of car. We had the Rover Streetwise, the Volkswagen Polo Dune and the Citroen C3 XTR to name but a few. These have all proved to be an evolutionary dead end for their manufacturers yet if anyone could be relied on to make the genre work, it's Fiat. With good reason too. The Panda 4x4 looks of this City Cross model suggest that light off road prowess is possible. A glance at the still-restricted ride height though, confirms that this is very definitely not the case. Still, if looks are everything, then this variant will certainly stand out on the school run. Power comes from the brand's familiar 1.2-litre 69bhp petrol unit and it goes to the front wheels only. Rest to 62mph occupies 14.5s en route to an academic 96mph maximum. Like any other Panda, this one's especially at home in a city environment. True, the five-speed gearbox could be a little more precise, but you'll appreciate the way this car takes even quite nasty small urban bumps in its stride. And delivers neat little touches like the steering's 'City' mode option to increase the assistance it gives at parking speeds so that you can use the tight 9.3m turning circle more easily. Urban-friendly through and through you see. The Panda City Cross certainly looks the part, although you'd have to give it a bit of a forensic examination to distinguish it from the full-fat 4x4 Cross variant. This model comes with body-coloured front and rear bumper inserts and side mouldings, plus contrasting black for the door mirror caps, roof bars and door handles. Completing the off-road look are the same 15-inch alloy wheels that can be found on the Panda Cross. Inside, the City Cross features a grey dashboard fascia with matt black instrument panel inserts and smarter seats, characterised by black and grey fabric with black eco-leather side inserts. Otherwise, the design is much as it would be in any other Panda, based upon what Fiat's designers call 'a squarical' theme, rounded rectangles in vogue everywhere from the headlamps to the front air intake, from the wheelarches to that trademark extra third rearward side window. The squarical touches continue on inside. You'll find them in the instrument binnacle, on the steering wheel boss and on the ventilation controls. The dashboard can be enveloped in a colourful frame of your choosing, with a roomy storage pocket in front of the front passenger supposed to evoke a nod towards original Eighties Panda motoring. As for rear seat passenger space, well thanks to slimmer seats, it's perfectly adequate for a couple of fully-sized adults. Storage for big items is taken care of by a 225-litre boot. That's one of the largest luggage compartments in the city car segment. Getting your Panda dressed up like this doesn't come cheap. The cost of this City Cross model is around £13,000. That makes this variant about £3,500 more han a base Panda 'Pop' 1.2-litre derivative. Even the most luxurious Panda 'Lounge' version costs nearly £2,500 less. Perhaps it's more relevant to point out that a full-fat Panda Cross 4x4 costs around £3,250 more - though as well as AWD, that car does feature a pokier and more economic 0.9-litre TwinAir 85bhp turbo petrol engine. If you do want the City Cross derivative, you might want to know that a better-equipped 'Style Pack' variant is available for £500 more. This adds ultrashine roofbars, side mouldings and a skid plate as well as body coloured door mirrors and front red hooks, to bring it in line with the Panda Cross. Inside, the City Cross style pack includes an upgraded copper dashboard and panels and seat upholstery to match its four-wheel-drive sibling. Options include side airbags and three rear seatbelts. The 8v 1.2-litre petrol engine being used here is one of Fiat's oldest units. Hence the very unremarkable efficiency figures - 51.4mpg on the combined cycle and 129g/km of CO2. The car is covered by a three-year, unlimited mileage warranty and there's 36 months of breakdown cover included as well. Servicing needn't be too costly as Fiat parts are relatively cheap. The brand also offers fixed price service plans that take care of all service charges, labour and replacement fluids. You can pick from durations that span from one to five years, with corresponding mileage from 9,000 to 45,000 miles. The Fiat Panda City Cross is easy to view cynically, but give it a chance and it more than justifies its existence. No, it's not at all capable in the rough, and nor should it be expected to be, directing drive to its front wheels only. But be honest; have you ever seen any sort of Panda 4x4 model anywhere where AWD would actually be needed? No, me neither. If you want a citycar with SUV attitude, the Panda City Cross might make sense, providing you get a good deal and don't mind the old-tech engine beneath the bonnet.